CD review: "Fair and Square"
This review first appeared in the San Diego Evening Tribune. Once in a great while you come across an album that just grabs you and won't let go; an album which, as the last notes fade, causes you to jump up, flip the album over and start again from the beginning. 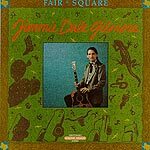 Jimmie Dale Gilmore's solo debut doesn't let you catch your breath the second play-through, either. From the opening riffs of Townes Van Zandt's "White Freight Liner Blues" through the closing chords of "Rain Just Falls," Gilmore leads his band through a rambunctious set of rockabilly, country and swing that leaves the listener exhausted. Long a staple of Austin's fertile music scene, Gilmore can go uptempo rock 'n' roll like Jerry Lee Lewis or the late Ricky Nelson. He can slow it down as well, and songs like Butch Hancock's "Just the Wave, Not the Water" or Joe Ely's "Honky Tonk Masquerade" are as emotionally evocative as his cover of "Trying to Get To You" is immersed in pure rockabilly spirit.